Do you love eating white rice but afraid that it may not be healthy for you? White rice is always said to be not a healthy choice compared to brown rice. So, let us see whether white rice is healthy for you or not. First of all, let us see which rice is a healthier option according to the opinion of the experts. White rice is the popular form of rice that is consumed by the people across the world. We get white rice when the bran of the rice is removed and the rice is polished. It has lots of health benefits and contains about 90% carbohydrates in it. The rest 10%of white rice is comprised of 8% protein and 2% fat. Brown rice is the naturally occurring form of rice. We do not process brown rice and the bran is also not removed from this rice. As you know, it is in the bran that most of the nutrients are present. It is also low in carbohydrates. However, it has higher amounts of fat than the white rice. When we consider the nutrients, we can say that brown rice is more nutritious than white rice. But this does not mean that brown rice is healthier than white rice. There are also other factors to take into consideration. So, let us see some major differences between brown rice and white rice. As mentioned earlier, white rice is in the polished form. The bran and the germ are removed from white rice. On the other hand, brown trice retains the germ and bran in it. The germ can go rancid very fast, and the higher amount of polyunsaturated fatty acid is oxidized easily. This can cause many adverse reactions in your body. This means that all the nutrient-rich bran can lead to potentially difficult symptoms. Because of the presence of bran in brown rice, it contains more dietary fibre than white rice. Although this is very beneficial for people who do not eat fibre, it may not be so good for those who already have enough fibre in their diet. When you consume excess fibre, it can cause intestinal gas, bloating and abdominal cramps. White rice, on the other hand, is low in fibre content. This makes it beneficial for those who suffer from diarrhoea, colitis and morning sickness. Brown rice also contains several anti-nutrients. Anti-nutrients are substances that can prevent the absorption of nutrients in the body. They also cause the loss of nutrients from the muscles and tissues. So, although brown rice is rich in nutrients, it is also rich in anti-nutrients. This means that you have to be careful when consuming brown rice. White rice is devoid of anti-nutrients and enables proper absorption of the minerals. Phytic acid is the main anti-nutrient that we usually remove by soaking brown rice in water. But according to studies made, phytic acid can still remain in the bran after soaking brown rice for more than 20 minutes. Brown rice may also contain higher amounts of arsenic, which is a toxic material. 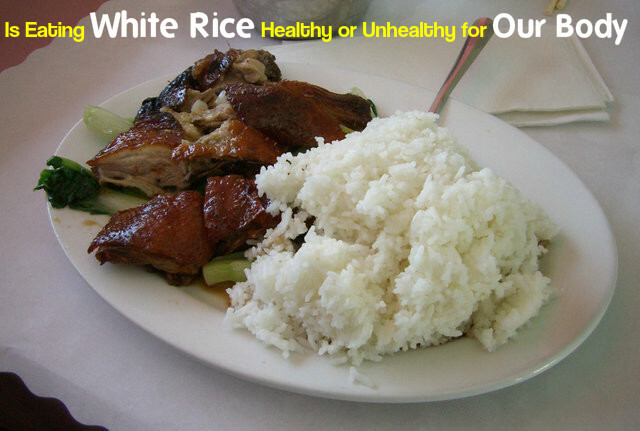 White rice is often avoided and labelled unhealthy because of the presence of starch in it in high amounts. Health activists always advise people that starch is unhealthy for them. In fact, starch is quiet essential for the body. It is needed for the basic nutrition. The only thing to keep in mind is not to consume it in excess. Having it in moderate amounts is beneficial for the body. Starch is said to break down the glucose, and it also causes a rise in the insulin levels, which can swiftly escalate to insulin resistance. However, our body requires glucose to function properly. The glucose that we get from starch and carbohydrates does not lead to insulin resistance. Insulin resistance is caused when the cells in the body are not able to absorb glucose. White rice has mild diuretic properties and helps in proper digestion. It is also acts as a natural anti-inflammatory agent. The protein present in white rice helps in the proper development of muscles and preserving the lean body mass. Manganese in white rice makes sure that you have a strong immune system. Thiamine in white rice is essential for cognitive process. White rice is also a good choice for people suffering from high blood pressure and kidney problems. This is because white rice contains sodium only in low amounts. Looking at the properties of brown rice and white rice, we can see that brown rice, although it is rich in nutrients and dietary fibre, does not make a healthier option than white rice. This is because of the presence of anti-nutrients in it like phytic acid, which can inhibit the absorption of minerals like zinc and iron. Actually these factors only highlight the fact that white rice is better than brown rice. White rice does not contain PUFAs. It also does not contain germs that can turn rancid quickly. So, you can conclude that white rice is actually healthy for you to eat. Now you can consume that bowl of white rice you have been avoiding for a long time, and enjoy its benefits. It is also tastier than brown rice. How to Cook White Rice Perfectly? Rinse white rice thoroughly before you cook it. Now cook it in a heavy bottom pot to prevent crusting. Adding one spoon of oil when you cook rice prevents the rice from sticking to each other. Remember not to stir when you cook rice. This can damage the rice and also make it sticky.